Valentino Rossi’s second place at the Argentine MotoGP on April 2 marked the 23rd anniversary of his very first Grand Prix race, the 1996 125cc Malaysian GP, which he finished in sixth position. The Italian motorcyclist has spent more than half his life racing in the World Championship. The 40-year-old, who might just have found the Holy Grail fountain of youth, has proven that age is simply a number with his competitive nature still on track. The closest age gap Rossi shares with a current MotoGP rider is with 33-year-old Cal Crutchlow, who is seven years his junior. He now races riders who once watched him off the screens of their living room TVs at just five-years-old, or younger. Rossi is so much more than just a champion of the sport, he is an icon. No figure to date in MotoGP has had both a commercial and competitive impact on professional motorcycle racing the way he has. By 1997, just his second year in the World Championship, Rossi took out the title, the first of nine. He gained a legion of followers quickly, not just from his wins, but his fierce riding style that kept viewers on edge as they watched him gun for the front. Rossi brought something different to the sport - talent paired with character and maybe a pinch of crazy. He quickly became “the cool kid” and everyone wanted to watch him race. Because no one had ever seen someone like him before: just as entertaining off the track as he was on. An array of interesting and colourful hairstyles, helmet designs that went beyond a solid colour, pre-race rituals, on-track rivalries, and post-race celebrations are just a few of the changes a young Rossi brought to our screens. He pioneered a movement that would be emulated by generations to come. In celebration of his 23rd year of performance in the Grand Prix, we take a look at five unique ways Rossi has had an impact on motorcycle racing like no other. 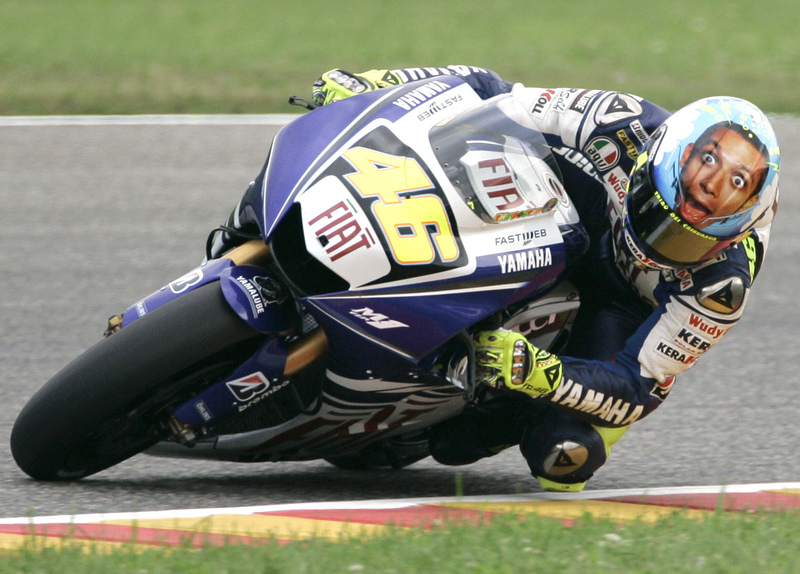 Rossi is the only rider to have won the World Championship across four different classes. The nine-time Grand Prix World Champion has seven premier titles, one in the 500cc class and six in MotoGP. He holds one title each in the 125cc and 250cc categories (categories which were replaced in 2012 and 2010, respectively). Rossi was always going to look good while racing. Right from the start of his career, Rossi teed up with designer Aldo Drudi and together they created whimsical helmet designs. Before this, helmets weren’t seen as much more than a protective device for riders, smeared with boring solid colours and logos. Rossi, perhaps without knowing it at the time, created a brand, starting with one of his earliest helmet designs: the sun and moon. They are symbolic of Rossi's two personalities, the positive happy-go-lucky attitude and the darker competitive nature required to take out a win. Together, Rossi and Drudi initiated a completely different approach to helmet designs. Rossi’s on track competitors soon followed suit, commissioning Drudi or other designers for their edgier looking helmets. Drudi is now one of the most sought after helmet designers in the world, even outside of the motorsport industry. In recent years, Rossi has worn a minimum of four different helmets each year. These are his annual helmet, his winter-test helmet and the two exclusive helmets which fans are always itching to see: those designed for two Italian Grand Prix, Mugello and Misano. In 2014, Rossi initiated the VR46 Academy. Located in Rossi’s hometown of Tavullia, the academy has produced a number of successful Italian riders since its creation. “The target is to raise young Italian talent and give them an opportunity to shine,” Rossi said about his academy. One of the main initiatives of the academy, coupled with help from the Italian Motorcycle Federation, is to rebirth the 1990s Italian school which produced champion talent for Italy. As of last year, one of Rossi’s very own academy graduates, Franco Morbidelli, was the first to move up to the same class as Rossi and now competes against his teacher in MotoGP. Rossi owns two teams in the Grand Prix under the SKY Racing Team by VR46 banner. His Moto3 team debuted in 2014 and his Moto2 debuted in 2017. Across both classes, SKY Racing Team by VR46 made their maiden win last year with rider Francesco Bagnaia in Moto2. Academy riders are not restricted to riding for Rossi, and many can be seen riding for teams in Moto3 and Moto2, dubbing the VR46 symbol on their leathers or helmet. So you thought Daniel Ricciardo drinking champagne out of his sweaty shoe was different? In the early 2000s, Rossi began a new wave of post-race victory celebrations. He began trackside performances that saw his team dress up as everything from bowling pins to represent Rossi’s winning strike, to police officers giving him a fine for going too fast. Not many people can make a colour symbolic. With Grand Prix grandstands painted with yellow flags and the occasional fog from a vibrant flare, Rossi has made the colour yellow just as famous as Ferrari is for red. His 46 is eminent and in recent years, it has become all too common to stop at a set of lights and see a motorbike rider pull up or buzz past with a vivid coloured helmet: a Rossi helmet. From clothing and leathers to mini motorbike models and helmets, Rossi is also a business man. Catch The Doctor – who is currently third in the championship – this Sunday for the American Grand Prix (Monday, 5:00 am AEST).